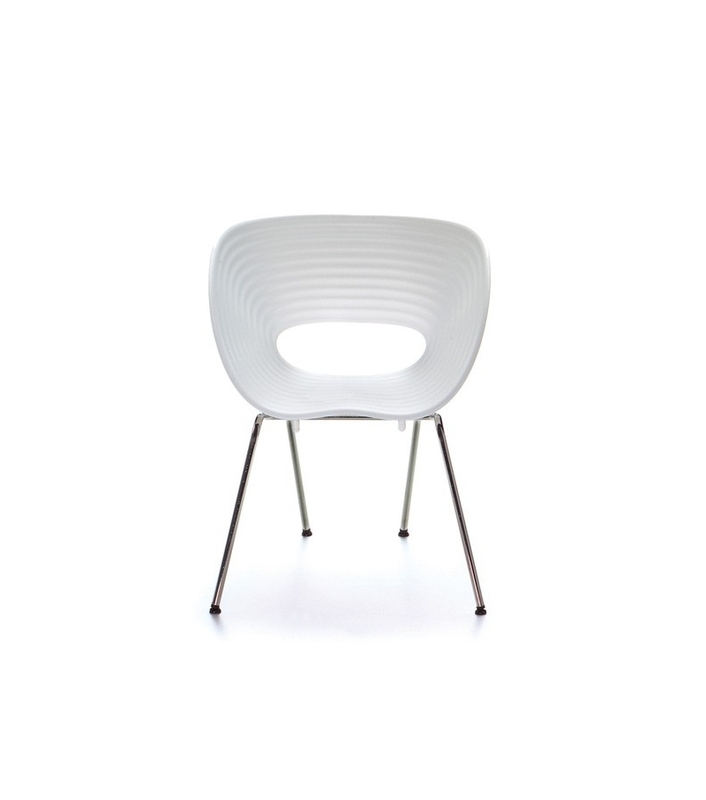 Vitra Miniature Tom Vac chair, Arad: The Tom Vac Chair was first realized as one element in a sculpture consisting of 70 stacking chairs named »Totem«. Commissioned by the magazine Domus, it was set up in the centre of Milan during the Salone del Mobile in 1997. The seat shell with the characteristic wave profile is based on earlierversions Ron Arad sketched for the dining room. Vitra Miniature Tom Vac chair, Arad: The Tom Vac Chair was first realized as one element in a sculpture consisting of 70 stacking chairs named »Totem«. Commissioned by the magazine Domus, it was set up in the centre of Milan during the Salone del Mobile in 1997. The seat shell with the characteristic wave profile is based on earlier versions Ron Arad sketched for the dining room of a house in Tel Aviv. The first small series for »Totem« was created in just four months. Though it is a complicated metal to manufacture, vacuum-formed aluminium proved to be a suitable material. 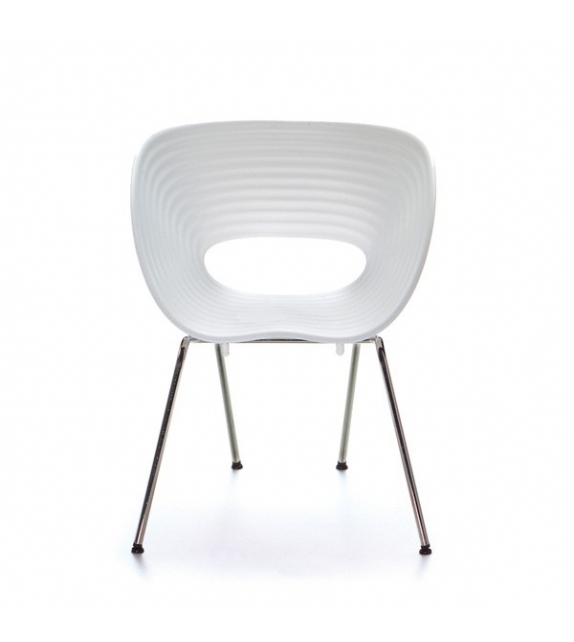 In collaboration with furniture maker Vitra, for whom he had already produced the Well Tempered Chair back in 1986, Ron Arad developed, within a very short time, a version of the Tom Vac Chair suitable for mass production. Seen within the context of Arad’s complete work, which is largely characterized by »one offs«, the chair is something of an innovation by virtue of its industrial and by extension inexpensive production. 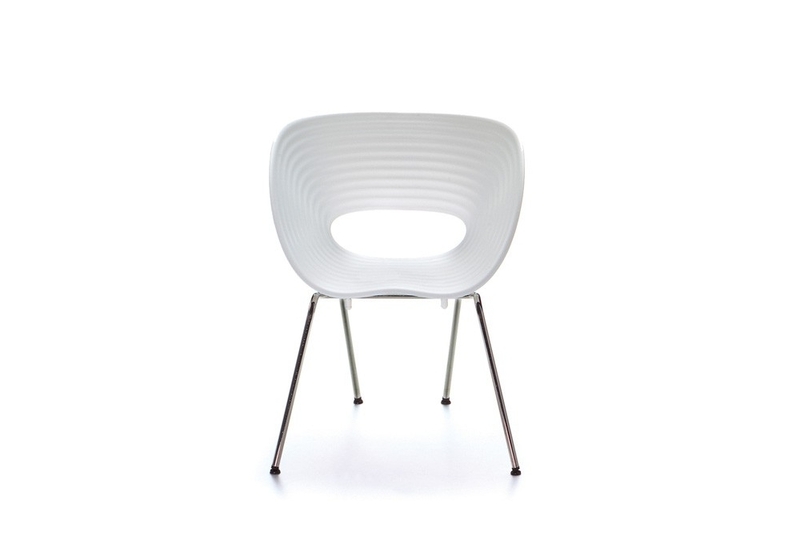 While the design of the Tom Vac Chair only deviates minimally from the first plan, the flexible seat shell of polypropylene offers a high degree of comfort. Plastic, chromed steel wire.